The Chapel was opened in 1722, with the gallery being added in 1727. Dr Philip Doddridge preached from the pulpit, which pre-dates the Chapel, for a few years from the initial opening. Our organ which dates from 1890 was gifted to the Chapel by Hugh Atkins. The ladies of the Atkins family created two large embroideries around 1902 in memory of Elizabeth Atkins; they represent one of the oldest religious symbols, "The Tree of Life". The design is thought to have been based on "The Apple Tree" by William Morris. Our Clock dates from around 1740 and is a "Parliament Clock". Many of this style of clock appeared in Chapels at the time when Parliament placed a tax on domestic clocks. It was restored in 1991 and keeps very good time. 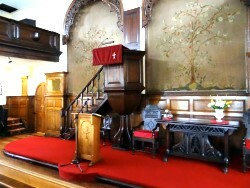 A Communion Rail (now removed), modern pews and additional panelling were completed around 1920. The upper gallery still retains original features. The burial ground was full by about 1890, the last burial being that of Elizabeth Atkins in 1892. 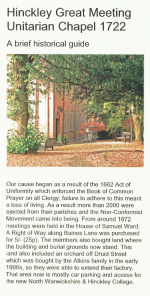 The gravestones were removed in the 1959 as some were damaged and dangerous, many are laid flat nearer the Chapel. Some of our town's earliest frame knitters are buried in the grounds. The Sunday School rooms and Chapel entrance were added in 1869, with later additions have seen constant use ever since.